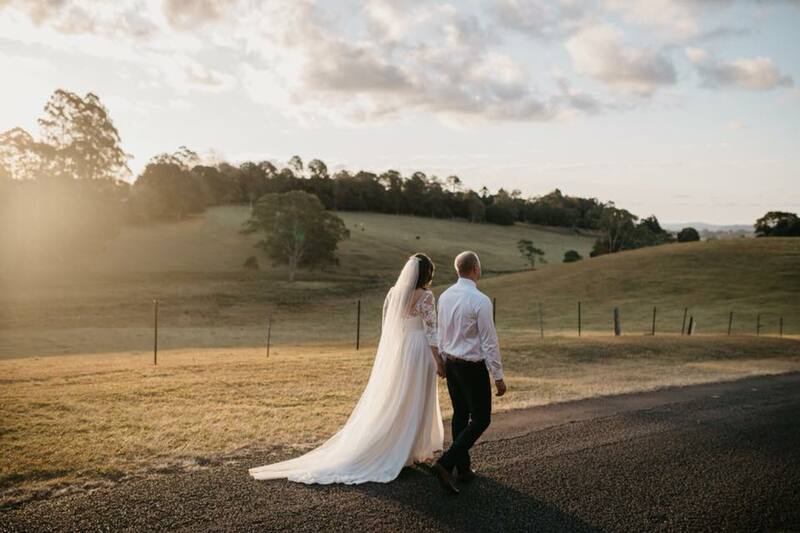 Matt & Sally’s wedding day up at Maleny Manor was absolutely beautiful! I’ve known Sally & her family for a few years, just as acquaintances really as I know Sally’s Dad quite well, and I also had the pleasure of doing Sally’s sisters 21st Birthday a few years ago as well. So I was very excited to hear about their big day coming up and their plans. After sitting down with them to discuss their wedding day back in December 2017, we went through some questions and details as to how their day would unfold. Matt originally had a friend to be their MC, but after we had a good chat, they were confident that having me as their Wedding MC would be best. A few meetings later, the day was already here and boy was it picture perfect. I’ve had the pleasure of working at Maleny Manor a few times now, and the team there always do a great job. I arrived nice and early to setup for the Ceremony & Reception, and it wasn’t long until Sally’s dad, Tom walked her down the aisle and handed her over to Matt. Following a beautiful Wedding Ceremony, came a gorgeous dinner with friends & family and an atmosphere that was just picture perfect! The cake was simple yet very elegant, along with a featured donut wall and beautiful table settings. I was secretly looking forward to the Father Daughter Dance, as Sally wanted to do something special for her dad, which involved a secret recording where she spoke about her Dad and then played that during their dance. But what Sally didn’t know was that I had secretly arranged a visit with Sally’s Dad to record a message to Sally, which would be played during the dance as well, unaware to Sally. The result…. a very special emotional dance that Sally and her Dad, Tom were not expecting and it was just beautiful!